Are you happy with your XC60? Absolutely! It is the best SUV out there.... I recently drove the brand-new Cadillac SUV as a loaner, and it was every bit as good as the Volvo...but not better, several thousand dollars more, and my Volvo is almost 3 years older! This is my wife's daily driver. We traded in a stodgy lexus RX350 for the Volvo and never looked back. You are goig to LOVE your new car! I should clarify one thing: the 2018 is totally redesigned from the 2014 to 2017. It isn't shown this way yet in our system because I haven't entered features and specs for the 2018. I'll do this soon. The new XC60 will have more in common with the XC90 than the 2014-2017 XC60. I think people like the XC90 a lot--except it has required considerably more repairs than the average car. It is possible that they've worked the initial bugs out with the 2018s, too soon to say. battery had to be replaced at 15,000 miles after "insufficient charge" warnings; limited rear seating leg room and narrower front seat room than expected. Disappointing fuel consumption (even when babied). She rides and handles very well with good cargo length. I haven't seen a 2018 model yet. 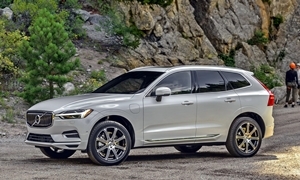 The XC60 is Volvo's more important model. It shares a tremendous amount of the larger XC90 platform. Since the engine and electronics are largely the same, most of the larger software gremlins have been sorted. As a former SPA platform owner (2016 XC90), my pro-tip is that Volvo updates software rather frequently and you'll want to let the dealer know if you're experiencing any issue as there is likely a software update to remedy it. This could be anything from the obvious control of screen and infotainment but to the unobvious things like temperature controls, unusual alerts, even how hard the transmission shifts--all software managed. Regarding fuel economy on the Drive-E engines. They're small but powerful. Drive with a lead foot and they'll drink fuel like a teenager drinks Red Bull, which is to say excessive. My previous Volvo was the wonderful 2016 XC90. It achieved an average 16MPG under my lead foot. My current Volvo is the V60 Polestar with a similar Drive-E engine... we're operating at a more dignified 22 MPG despite the lead foot being oh so heavy.